Another simple card. 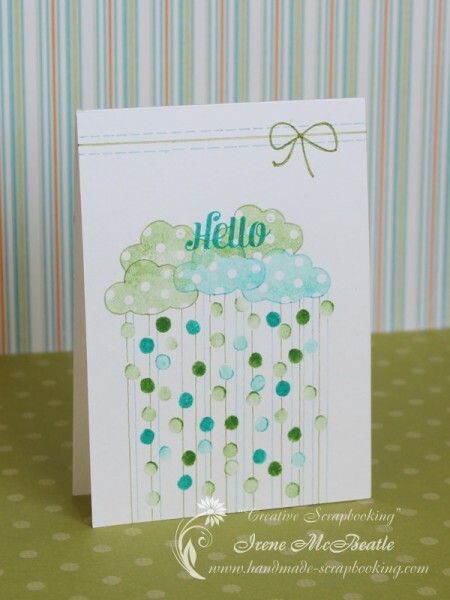 This time it was created mainly with stamping. 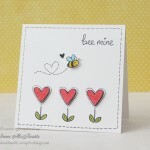 A couple of stamps, a couple of inks – and the card is done! I was trying the bokeh effect technique from the Clean and Simple Cards 3: One Layer Cards class. The small circle spots were stamped with… an eraser on the opposite side of a pencil. Some dots are the first impression, some are the second and even the third. This allowed me to have different tones of the same color. I stamped the clouds, the word “Hello” and the dots with two colors of distress ink: peacock feathers and mowed lawn. Then I added some lines with distress markers: broken china and peeled paint.